Troll is not the most attractive of words and certainly does not describe the most beautiful of creatures. In recent pop culture, the term “internet troll” describes someone who hunts down individuals online and plagues them with abuse. Then, of course, there is the amazing 2010 cult movie Troll Hunter from director Andre Ovredal which is well worth checking out. However, Scandinavian online slot developer NetEnt have arrived to give the poor old trolls an image makeover in this creative and really attractive slot that has become something of a hit at online casinos. 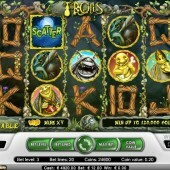 This 5-reel, 20-payline online slot is packed full of trolls, except these are not ugly creatures that are intent on causing you harm. These are cuddly little blighters that clearly want to help you win some big prizes. 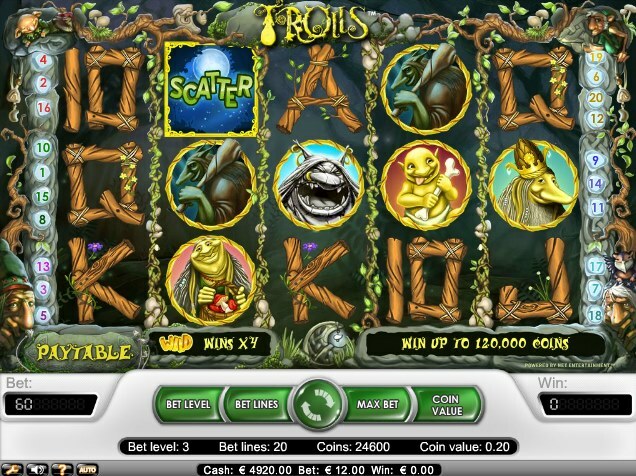 The first thing that sets Trolls apart from the rest of the slots crowd is that it has two functioning Wild symbols. There is the regular Wild that substitutes for all other symbols, except for the Scatters, to complete winning combinations. In addition, it multiplies all winnings by two. Then there is the golden Wild symbol that also substitutes for all other symbols, except for the Scatters, to complete winning combinations. However, this golden Wild symbol multiplies all winnings by four, making it that little bit better than the regular Wild. The free spins bonus round is also a lot more exciting than most slots on the market. You must hit three or more moonlight Scatter symbols across the reels to trigger the free spins. If you hit three Scatters then you will win 10 free spins, if you hit four Scatters you will be awarded with 20 free spins and if you are fortunate enough to hit five Scatters then you will receive 30 free spins. The wonder does not end there because all wins achieved during the free spins will enjoy a multiplier value of 3x to increase your wins. Trolls is one of those games that really deserved a much higher profile release when it came out. It slipped under the radar a little and it might not have been publicised in the same way that board game-themed Monopoly Dream Life or the fruity-filled Reel Rush were but it deserves just as much credit for its unique gameplay. Make up for lost time and indulge in a spot of troll-hunting today.